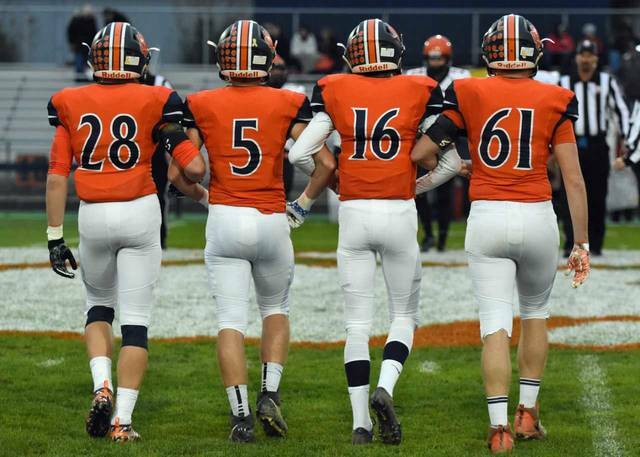 Don Tudor | Galion Inquirer Senior leaders (from left to right) Colbey Fox, Steve Hoffman, Elias Middleton and Noah Grochowalksi approach midfield for the pregame coin toss on Friday. In the dismal weather, Galion was defeated by the visiting North Union Wildcats; 49-35. GALION — In week eight football action, the Galion Tigers welcomed the North Union Wildcats to Unckrich Stadium for a Mid-Ohio Athletic Conference clash in the Tigers’ annual homecoming game. BUCYRUS — The Colonel Crawford Eagles made the short bus trip to Bucyrus on Friday evening to meet up with the Redmen in Northern-10 Athletic Conference action. Crawford would improve to 5-3 overall on the season and 3-2 in the N-10 with a 21-0 shutout of Bucyrus. The Redmen fall to 2-6 overall with the loss and currently sit at 1-4 in conference play. https://www.galioninquirer.com/wp-content/uploads/sites/38/2018/10/web1_senior-leaders.jpgDon Tudor | Galion Inquirer Senior leaders (from left to right) Colbey Fox, Steve Hoffman, Elias Middleton and Noah Grochowalksi approach midfield for the pregame coin toss on Friday. In the dismal weather, Galion was defeated by the visiting North Union Wildcats; 49-35.